Following a healthful diet provides essential nutrients for long-term health, but even the healthiest diet has room for a treat now and then. Eating your favorite foods in moderation can prevent you from feeling deprived and keep you on track with your healthful lifestyle. 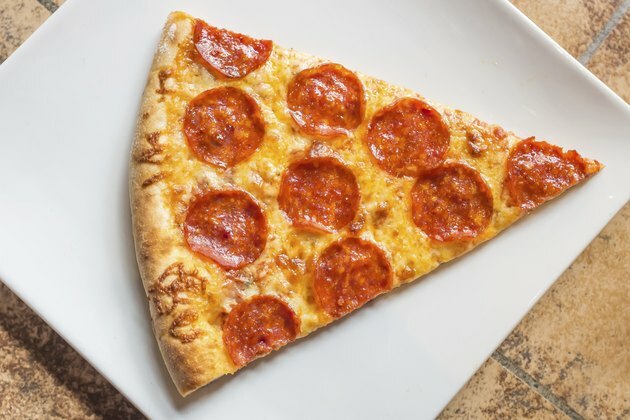 Pepperoni should not make up a part of your regular diet -- it's high in fat, sodium and calories -- but it does contain some beneficial nutrients, so you can consume it occasionally as part of a balanced diet. Pepperoni comes loaded with calories. A single 3-ounce serving contains 419 calories -- nearly one-third of the daily allowance for a 1,500-calorie diet or more than one-fifth for a 2,000-calorie diet. Only 20 percent of these calories come from protein, a nutrient your body needs for tissue maintenance. The remaining 80 percent of these calories come from the pepperoni's 37 grams of fat, which includes 12.5 grams of saturated fat. While fat has some beneficial properties -- for example, it helps with vitamin absorption -- consuming so much saturated fat harms your blood cholesterol levels, increasing the amount of harmful cholesterol while reducing the level of good cholesterol. Pepperoni offers some nutritional advantages by boosting your mineral intake. A 3-ounce portion of pepperoni contains 2.1 milligrams of zinc, which contributes 19 percent toward the recommended daily intake for men and 26 percent for women. Your cells can utilize zinc to help control gene activity, and getting enough zinc supports your nerves and immune system. A serving of pepperoni also provides 500 micrograms of manganese -- 28 percent and 22 percent of the daily manganese intakes recommended for women and men, respectively. Boosting your manganese intake protects your cells from damage, supports your metabolism and nourishes your bones. Eating pepperoni also helps you consume more beneficial vitamins. It provides significant amounts of pantothenic acid and vitamin B-12. Both of these nutrients help ensure proper brain function because they help your brain cells make chemicals involved in nerve communication. Getting enough B-12 in your diet also fights disease, while vitamin B-12 deficiency increases the risk of birth defects, as well as depression. A 3-ounce serving of pepperoni contains 0.99 milligram of pantothenic acid -- one-fifth of your daily needs -- as well as 1.45 micrograms of vitamin B-12, which contributes 60 percent toward your recommended daily B-12 intake. Pepperoni's astronomical sodium content can pose a serious health risk. A single 3-ounce serving contains 1,479 milligrams of sodium -- almost two-thirds of the 2,300-milligram limit. If you're over 51 years of age or you suffer from high blood pressure, a serving of pepperoni contains almost your entire 1,500-milligram daily sodium limit. Your body needs sodium to control your blood pressure, but too much sodium causes excessively high blood pressure. Over time, this increases the strain on your blood vessels and kidneys, damaging your tissue and contributing to kidney and cardiovascular disease. Making pepperoni involves treating it with nitrates -- chemicals that convert into harmful nitrites during the curing process. This curing gives pepperoni its distinct flavor and color, but it also triggers migraines in some people. Consuming nitrates also poses a health risk for pregnant women because the nitrates react with hemoglobin in the bloodstream, preventing the hemoglobin from properly transporting oxygen throughout the body. This can harm the developing fetus, and for babies it can cause "blue baby syndrome," so-named because of the blue-tinged hue associated with oxygen deprivation.